In 1879 the famous showman, P.T. Barnum joked that, “Coloradoans are the most disappointed people I ever saw. Two-thirds of them come here to die and they can’t do it.” Barnum was referring to Colorado’s growing reputation in the late-nineteenth century as a popular health destination. 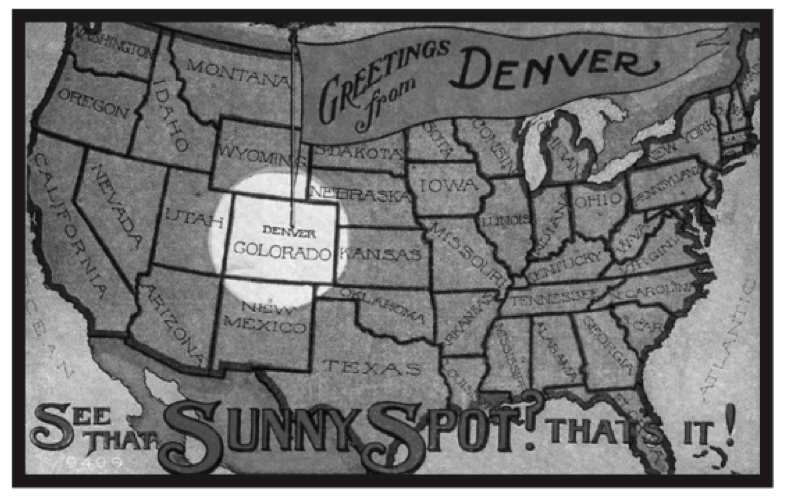 Long before the state became known as a world-class ski destination or a haven for marijuana tourism, thousands of health seekers flocked to Colorado for its ample sunshine, high altitude, and excellent air quality – attributes believed critical in providing respite to those suffering from consumption (now known as tuberculosis). Quite early in the state’s history various city boosters, businessmen, and railroad executives began courting elite health seekers to the region. Colorado’s fame as a health paradise became so preeminent that between 1890 and 1920, historians estimate that as many as forty percent of the state’s new residents relocated from the East to improve either their own health or that of a family member. Journalist Roscoe Fleming perhaps said it best when he argued that “consumption” brought more people to Denver than did the search for gold; indeed, he noted, the TB bacillus should be “commemorated in stone.” The shifting responses to these migrants in rapidly developing cities in the West, or what historian Gunther Barth called, “instant cities,” offers a unique site to explore the relationship between disability, citizenship, and urban development at the turn of the century. Americans have a deep-seated tradition connecting health with environment. Of course, linking the two was neither new nor unique; Hippocrates was among the first to emphasize the relationship in his treatise, Air, Water, and Places. Yet, as historian Conevery Valencius has demonstrated, early American settlers adapted and expanded on the Hippocratic notion of healthy environments in order to make sense of their new world, creating a belief system that tied the wellbeing of the body to the health of the land. Knowledge of healthy rivers, miasmatic swamps, and malarial air informed and influenced where Americans settled in every phase of American expansion. In the second half of the nineteenth century, however, physicians began developing new theories of medical climatology that emphasized the therapeutic benefits of specific climates based on scientific data. The “science” of medical climatology offered physicians a new option for treating patients. Instead of prescribing a tonic, for example, a doctor could simply advise his patient to move to a healthier climate. Depending on the stage, type of consumption, and gender of the patient, a doctor in the late nineteenth century might suggest a move to Florida, the Great Lakes, or the Adirondacks. 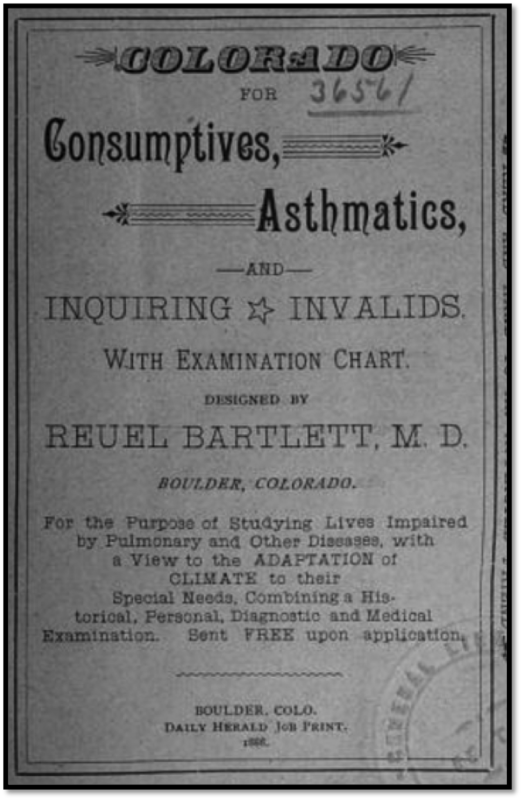 Bartlett, Reuel, “Colorado for Consumptives, Asthmatics And Inquiring Invalids With Examination Chart.” Boulder, Colo. Daily Herald, 1888. Increasingly, however, westward migration became the panacea for consumption in the United States. Health migrants flocked to cities like Los Angeles, Santa Fe, and Phoenix, believing that the dry air of the desert or the warm breezes of the Pacific coast offered curative properties. Because they were situated above what climatologists referred to as the “altitude of immunity” line (5,000 feet above sea level), towns and cities in the Rocky Mountains became the ideal location for health seekers. While the Swiss town of Davos became the focal point for consumption treatment in Europe, Colorado capitalized on its similarity to Davos and earned the nickname “the Switzerland of America.” Colorado became the center of medical climatology in the United States and Denver emerged as its epicenter, attracting several prominent climatologists and physicians. Denver’s popularity as a health destination did not stem from the advice of doctors alone. Sensing the immense profit potential from the ill American elite, and hoping to escape the boom-and-bust cycle that plagued many other western towns, Denver businessmen, railroad executives, and politicians scrupulously cultivated the city’s reputation by the extensive circulation of travel brochures, sanitarium advertisements, and health pamphlets. Denver, they claimed, offered the best of both worlds. It provided the sophistication of a cultured city combined with easy access to nature. 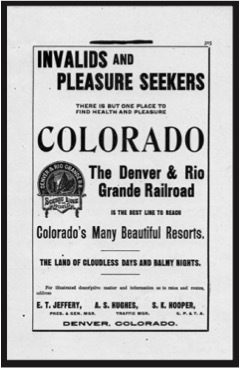 Railroad companies published ads in eastern newspapers naming Colorado as the “place to find health and pleasure.” Denver’s Chamber of Commerce circulated a brochure that claimed its “balmy climate…pure air” and “excellent sanitary conditions” afforded “Denverites . . . nearly perpetual youth.” The hyperbolic rhetoric of booster propaganda proved almost irresistible for many Eastern patients desperately seeking cures for their ailments. The largest group of health seekers, the consumptives, was often referred to as Denver’s “one-lung army.” The nickname was not meant pejoratively, as the one-lung army was considered crucial to Denver’s economic and cultural development. Journalist Julian Ralph argued that it was not from the miners and oilmen that the city of Denver achieved a measure of taste and refinement, but from the educated invalids: “They are New Yorkers, Bostonians, Philadelphians, New Orleans men, Englishmen – the architects, doctors, lawyers, and every sort of professional men being among them.”⁠ The emerging health industry in Denver also fashioned a robust market for physicians, nurses, druggists, social workers, charity organizers, and institution directors, as well as service workers like servants, cooks, and aides. While scholars have largely concentrated on the westward migration of consumptives, it is important to note that campaigns to attract health brought a wide range of migrants seeking rejuvenation. Writer, Thomas Galbreath recalled that he shared a boarding house with “dyspeptics, rheumatics, nervous wrecks, heart patients, kidney patients, eye patients, and Keely Cure patients.” Others came to Denver seeking relief from Civil War injuries, asthma, mental illness, and many other diseases, debilities, and disabilities. The rhetoric surrounding the westward prescription appealed to Americans suffering from a variety of infirmities because it hinged on the idea of transforming the weak and sickly into strong, responsible citizens. Going West was not just about chasing the cure – the journey represented an opportunity for transformation and rebirth. One doctor articulated this point: “Thousands of the population of this State . . . once belonged to this invalid class.” “Today,” he continued, as “useful, active citizens in the enjoyment of health and strength” they “attest the truth of [Colorado’s climate].” A colleague reiterated the emphasis on citizenship: “Some of the most energetic and useful citizens of the State were formerly weak-lunged, weak-willed citizens of other States,” she noted. The West promised not just a rejuvenation of the body, it promised a rehabilitation of one’s fitness for citizenship. Being free from disease or disability meant renewed opportunities to work, marry, or participate in civic and cultural life. Intertwined with the rhetoric of the climate cure were also deeply gendered understandings of the West as a context for shaping frontier masculinity. Physicians often evoked the popular male imagery of “the wilderness” as a form of cure, comparing the conquering of consumption to the taming of the wilderness. Doctors offered medical evidence to suggest that, in contrast to its rehabilitative effect on men, the western climate could be damaging to women invalids. As one neurologist remarked after presenting his findings on gendered differences in respiration, “[Colorado’s climate was] not so bad for men, but hard on women and horses.” Medical literature often warned women away from the mountain air, arguing it taxed their delicate constitutions. Despite the gendering of the western climate cure, women health seekers migrated to Colorado in significant numbers. In one study conducted in 1926, for example, forty-seven percent of its participants were women TB sufferers. My dissertation research also indicates that a significant portion of women physicians, not unlike their male counterparts, migrated to the city to alleviate their own consumptive conditions or other medical issues. Not surprisingly, Denver’s claims to being a health paradise were deeply exaggerated. As early as 1879, an observer described the dead bodies of consumptives quietly being loaded onto train cars and shipped back to their families. By 1908, Colorado had one of the highest tuberculosis morbidity rates in the country, while Denver had the highest TB death rate in the state. State leaders were adamant in maintaining the idea that Colorado’s climate made it nearly impossible to contract tuberculosis once residing in the state and Colorado physicians never ceased celebrating the healing power of climatology. Instead they blamed Denver’s death statistics on other factors. Row of windowless rooms rented out by night in Denver. Denver Tuberculosis Association. The deteriorating conditions of downtown Denver garnered much of the blame. 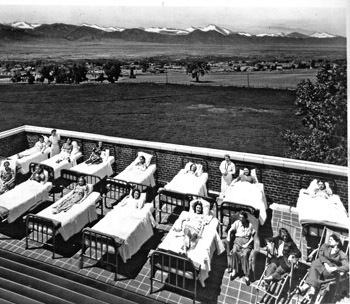 Life in the inner city was difficult for those who could not afford an exurban sanatorium in Denver’s foothills. Thousands of poor Denverites lived in substandard housing; the worst dwellings were windowless “coops” measuring four foot by five foot. Other physicians blamed incompetent eastern doctors who prescribed the “western cure” without considering patient income, the type of housing needed, or even the “fit” of the environmental context with a patient’s particular infirmity. As one frustrated Denver physician lamented: “The climate of Colorado is unsurpassed, but there is no well-authenticated case of its having raised the dead.⁠” Above all else, most western doctors blamed the behavior of health seekers themselves, arguing that health seekers new to the city spent too much of their energy on seeing the sites, drinking, and gambling, rather than focusing on their treatment. By the turn of the century, Denverites expressed growing concerns about what they saw as an increasing dependent class that committed crimes, stole jobs, scared children, and burdened resources. Health seekers were now seen as an imposition, rather than an asset. The explanations for this gradual shift in attitude are, of course, complex, but most salient, perhaps, was the transformation of medical and public understandings of tuberculosis itself. Once romanticized, hereditary consumption came to be understood scientifically as the contagious disease tuberculosis. Koch’s discovery of the tubercle bacillus in 1882 was a driving engine behind the gradual understanding of contagious diseases and the dangers they presented to urban populations. Despite these new understandings in epidemiology, health seekers continued to pour into Colorado well after the decline of medical climatology in scientific circles. Inexpensive railroad travel permitted larger numbers of poor health seekers into the city, including recent immigrants and African Americans. Denverites, who may have once been ill themselves, feared destitute health seekers because they perceived them to be destructive, dependent, and lacking the constitution necessary for citizenship. Racism and fear of contagion, combined with the increased job competition created resentment among Colorado’s longer-term residents against the sick and disabled. Jewish Consumptives’ Relief Society. Photo courtesy of the Ira M. and Peryle H. Beck Memorial Archives. © Penrose Library. A vigorous attempt to restrict the rights of invalids and the disabled in Colorado was one result of these developments. Politicians rejected the construction of new health facilities, debated a quarantine bill, a marriage restriction bill, and even considered requiring TB sufferers to wear bells around their necks. One writer joked that the bell legislation was only defeated because “the noise would be deafening.” Though these measures ultimately failed, one proposal that did become law early on was Denver’s so-called “ugly law.” As disability scholar Susan Schweik has demonstrated, “ugly laws” were passed in various states at the turn of the century that made it a crime for persons with “unsightly” disabilities to appear in public. Denver’s ugly law was unique in that it stipulated that unsightly or disabled indigents might be sentenced to care in an institution, rather than imprisonment or fines. The law proved a win-win situation for doctors, politicians, and business owners whose livelihood relied on “elite” health seekers. Wealthy invalids would continue to migrate to the state without fear of quarantine, even as city officials sought to bar the indigent and unsightly from city streets. The story of Colorado health seekers can best be summarized as the union of romanticism, incomplete science, and frontier mythology. 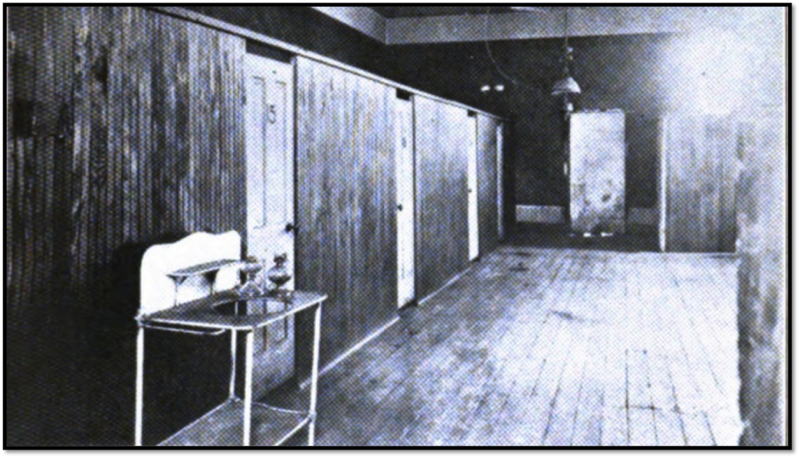 Although by the early twentieth century medical climatology had fallen out of favor, as doctors accepted the validity of germ theory, the appeal of climate therapy continued to lure health seekers to Denver well into the twentieth century. Indeed, Colorado and its capital city would continue to emphasize more modernized themes of health, wellness, and frontier mythology as its primary attractions throughout the remainder of the twentieth century and even into the present day. Jacqueline D. Antonovich is a Ph.D. candidate in History at the University of Michigan. Her dissertation, “Doctoring the Land: Women Physicians, the Politics of Health, and the Geography of Medicine in the American West, 1875-1930,” examines the westward migration of women physicians and their participation in formal politics, institution building, and public health activism in the region throughout the late-nineteenth and early-twentieth century. She is also the creator, co-founder and executive editor of Nursing Clio, a collaborative blog project that focuses on the history of gender, health, and medicine. Barnum’s quote was featured in several newspaper articles and city booster ephemera. It also appears in Robert Strahorn, To the Rockies and Beyond or A Summer on the Union Pacific Railroad and Branches, (Omaha: The New West Publishing Company, 1879), 67. These statistics show up repeatedly in various early-twentieth century writings, but as western historian Carl Abbott has pointed out, the numbers are difficult to verify. Roscoe Fleming, “Denver Civic Schizophrenic,” in Robert Allen, ed, Our Fair City (New York: Vanguard Press, 1947), 284. Carl Abbott, How Cities Won the West: Four Centuries of Urban Change in Western North America, Histories of the American Frontier (Albuquerque: University of New Mexico Press, 2008), 121-22. Fleming, “Denver Civic Schizophrenic,” in Robert Allen, ed, Our Fair City, 284. Gunther Paul Barth, Instant Cities: Urbanization and the Rise of San Francisco and Denver, The Urban Life in America Series (New York: Oxford University Press, 1975). Conevery Bolton Valenčius, The Health of the Country: How American Settlers Understood Themselves and Their Land (New York: Basic Books, 2002). The theory at the heart of the altitude of immunity line centered on the idea that elevation increased heart and lung function so that pure “aseptic” oxygen got deeper into the lungs and aided healing. Katherine Ott, Fevered Lives: Tuberculosis in American Culture Since 1870 (Cambridge, Mass. : Harvard University Press, 1996), 40. Denver Chamber of Commerce, Eleventh Annual Report, 1895 (Denver: News Printing, 1895), 28. Also see, Denver: Mining Camp to Metropolis (Niwot, Colorado: University Press of Colorado, 1990), 43. Julian Ralph, Our Great West: A Study of the Present Conditions and Future Possibilities of the New Commonwealths and Capitals of the United States (New York: Harper & Brothers, 1893), 319. Thomas Crawford Galbreath, Chasing the Cure in Colorado (1907), 29. The Climate of Colorado And Its Effects by Walter A. Jayne, M.D. American Climatological Association. Transactions of the American Climatological Association for the Year … Philadelphia: D. Appleton and Co., 1884-1913. Vol. 5, 55. Howell T. Pershing, “Nervous Disorders in Colorado,” Denver Medical Times, 28 (1908), 159. Denver Community Chest (The Committee on Health), “A Tuberculosis Study in Denver,” 1926, 6. Stephen J. Leonard and Thomas J. Noel, Denver: Mining Camp to Metropolis (Niwot, Colorado: University Press of Colorado, 1990), 43. City and County of Denver Health Department, Statement of Deaths (Denver: Board of Heath, 1909), U.S. Bureau of the Census, Historical Statistics of the United States (Washington, 1975), 59. Susan Edwards, “Nature as Healer: Denver, Colorado’s Social and Built Landscapes of Health, 1880-1930,” 225. L. H. Wood, “The Treatment of Consumption in Colorado,” 208. Galbreath, Chasing the Cure in Colorado (1907), 31. Much enjoyed reading your piece, Jacqueline. Fascinating background on why Doc Holliday headed for Colorado and how the “lungers” later became victims of discrimination. Big dollar health tourists are one thing but….